Belamcanda (bel-am-kan-duh) Iris Family (Iridaceae); Unpretentious perennials from China and Japan. Valued for it showy flowers and its glossy black seeds. B. chinensis (chin-nen-siss) Blackberry lilies are easily grown in average, medium, well-drained soils; poorly-drained soil, particularly in winter, could be fatal. Plant height, generally 2 to 4 feet high, varies depending on the soil conditions. Long, irislike leaves underscore flower blooms in July and August. 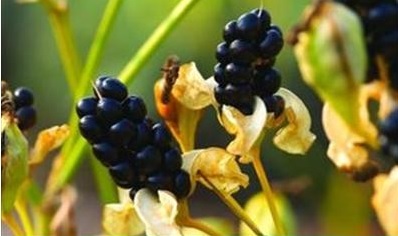 The common name derives from the clusters of black seeds, which are attractive to birds. This plant is often seen in the U.S. along roadsides and in open meadows, where it has naturalized. A heavy layer of mulch is suggested for northern winters. For best results, divide in early spring. Plants may self-seed in optimum growing conditions which helps keep these somewhat short-lived perennials in the garden. Excellent as a border plant, cut flower or foliage, dried flower or seed heads.